The House’s take on the perennial tale is an engaging family-friendly treat. The House’s kinetic take on E.T.A. 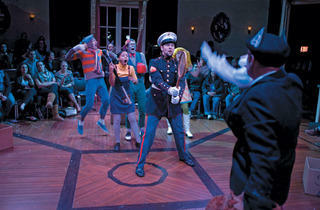 Hoffmann’s tale, first seen at Steppenwolf’s Upstairs Theatre in 2007, returns for a third annual outing at the Chopin. In Jake Minton and Phillip Klapperich’s recounting, young Clara (Paige Collins at her spunkiest) and her parents await the homecoming of Clara’s older brother, Fritz, for their annual Christmas party; instead, they receive word that Fritz, a Marine, won’t be coming home again. The following Christmas, Clara’s parents are numb with grief and skipping the party, until Clara’s great uncle Drosselmeyer (Loren Lazerine) arrives with a gift: a nutcracker that’s carved to look just like her brother. Soon the nutcracker and Clara’s other toys come to life to help her defeat the Christmas-hating Rat King and restore the holiday spirit to her house. 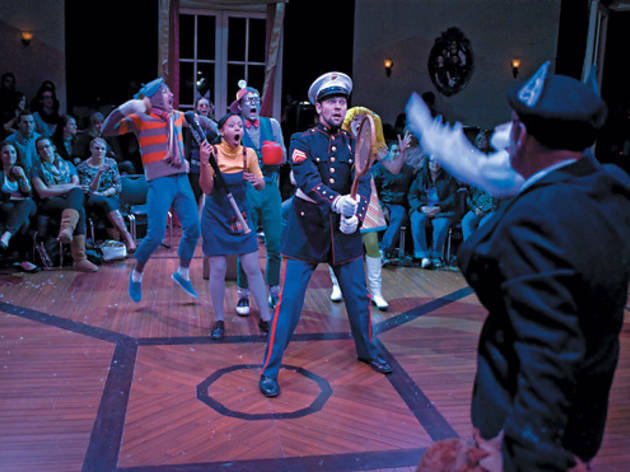 Collette Pollard’s clever in-the-round set design provides for multiple entrances and exits and a few well-hidden surprises when Clara goes “into the walls” to confront the Rat King at the play’s climax. Director Tommy Rapley admirably manages the heavy traffic, and Minton and Klapperich’s use of cast doubling feels particularly rich in Brenda Barrie and Benjamin Sprunger’s turns both as Clara’s increasingly distant parents and the rat vanguard. The play’s smattering of songs, composed by Kevin O’Donnell with lyrics by Minton, still feels as half-baked as Clara’s underdone cookies, but on the whole this Nutcracker is an engaging, family-friendly treat.